Not so very long ago, in the days of talent trees, this was one of the most popular sites to visit. If you wanted to know what the most popular talent selections were for your chosen spec, or if you wanted to know what the best specs were for any given class, this was the place to go. In the words of the sites creator “WoWPopular tracks the most popular Talent Builds, Glyphs, Gear, Enchants and Gems used by players in World of Warcraft.” The data is pulled from the armory and displays what everyone out there in Warcraft-land is currently using, equipping or reforging into. I find this site especially helpful when gearing alts. I use this site like a quick reference book. Here is a scenario I found myself in just last week. I recently decided it was time to start gearing up my druid. After some dungeons and Timeless Isle pieces, I got a piece of gear with a gem slot. This is the first time I’ve had to gem this toon in this expansion, oh my! After looking through Icy-Veins and deciding what stats I should be focusing on I then went to WoW Popular to take a look at the most popular gems for balanced druids to see what options I had and make an informed decision before buying anything. I pulled up a complete list of the most used balanced druid gems and could see what sorts of gems I had available to choose from. You can use this site as a quick reference for any of these topics. Are you curious what the most popular talent selections are for your class and spec? Here you can find a composite picture of what the most commonly used talents and builds are. 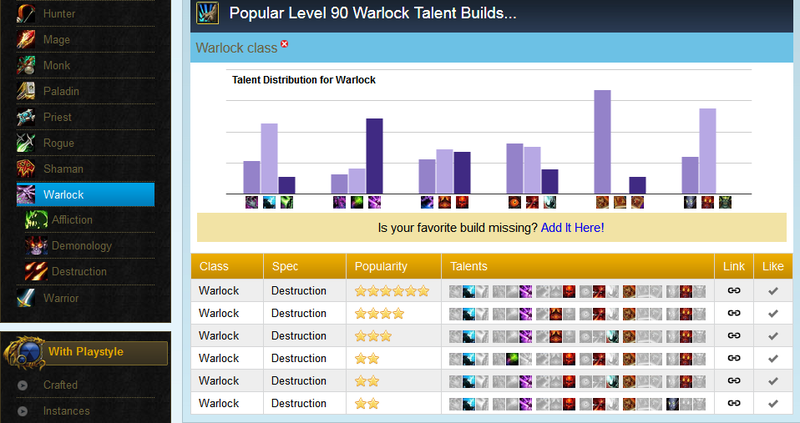 This is a screenshot of the current most popular Warlock builds. It is quite interesting to see how many other players are weighing in on talent selection. This site has a plethora of interesting tidbits like this. I’m sure Blizzard is looking at similar data, and it’s kinda neat that we have access to it as well. Using the site is pretty straightforward. Pick your class and spec from the first group then select the data you’d like to see for that spec from the groups just below it. You can also select your playstyle if you choose. If you PVP a lot you will want to see what the best selections are for your class in a PVP setting. WoW Popular has changed with the times quite adequately, and still provides a ton of interesting and useful information. If you haven’t been there this expansion it is definitely worth checking out! Go now! Go make the world a better place!